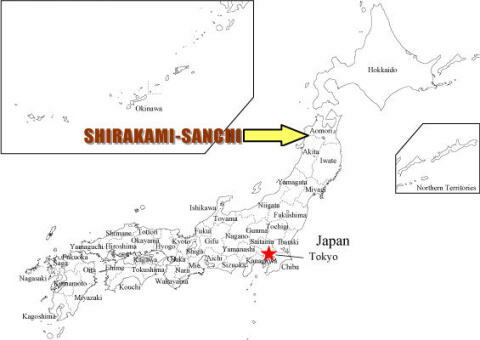 Shirakami-sanchi is a enormous mountain range of 130,000ha covering southwestern part of Aomori Prefecture and northwestern part of Akita Prefecture. 16,971ha area of beech tree primary forest in this mountain range was registered as world heritage in 1993. 3/4 of this area (12,627ha) belongs to Aomori Pref. The characteristics of Shirakami-sanchi is one of the biggest primary forest of beech tree in the world which was preserved almost untouched by human beings. 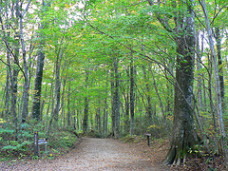 In this forest, great many kinds of plant grow such as community of beech-quercus crispula and Japanese Wingnut. There also live many kinds of animals despite the high altitude such as asiatic black bear (tsukinowaguma), Japanese macaque, black woodpecker and golden eagle. So the whole mountain range is like a forest museum. Especially in the world heritage designated area, primary forest is very well preserved and its value is considered very important on the global level. In the beech forest, there live more animals than other forest because there are a lot of plants which become the food of them. This forest also has function to adjust the water amount which flow to the river and to prevent the denudation of the land surface. These function and beauty of the forest have been highly appreciated nowadays in Japan. This area is registered as world heritage in order to preserve, so tourism infrastructure is not well improved. So you have to walk from the neaby busstops. Following is the major touristic places.